PERFORM bdc_dynpro USING 'SAPLMEOR'       '0200'. PERFORM bdc_field  USING 'BDC_CURSOR'     'EORD-MATNR'. PERFORM bdc_field  USING 'BDC_OKCODE'     '/00'. 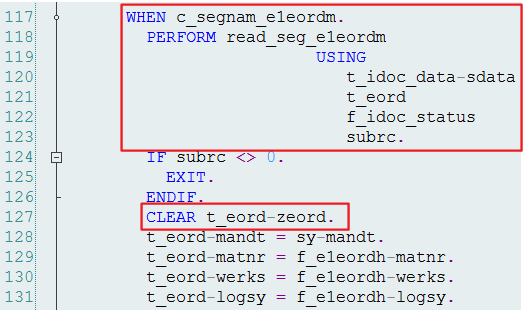 PERFORM bdc_field  USING 'EORD-MATNR'     '1000001974'. PERFORM bdc_field  USING 'EORD-WERKS'     '0040'. PERFORM bdc_dynpro USING 'SAPLMEOR'       '0205'. PERFORM bdc_field  USING 'BDC_CURSOR'     'EORD-BDATU(01)'. PERFORM bdc_field  USING 'BDC_OKCODE'     '=NS'. PERFORM bdc_field  USING 'EORD-VDATU(05)' '01.04.2016'. PERFORM bdc_field  USING 'EORD-BDATU(05)' '02.04.2016'. PERFORM bdc_field  USING 'BDC_CURSOR'     'EORD-VDATU(02)'. PERFORM bdc_field  USING 'BDC_OKCODE'     '=BU'. PERFORM bdc_field  USING 'EORD-VDATU(02)' '10.04.2016'. PERFORM bdc_field  USING 'EORD-BDATU(02)' '10.04.2016'. PERFORM bdc_field  USING 'EORD-LIFNR(02)' '510769'. PERFORM bdc_field  USING 'EORD-EKORG(02)' '0040'. PERFORM bdc_field  USING 'EORD-MEINS(02)' 'PC'. PERFORM bdc_field  USING 'EORD-EBELN(02)' '5500000667'. PERFORM bdc_field  USING 'EORD-EBELP(02)' '0010'. PERFORM bdc_field  USING 'EORD-AUTET(02)' '2'. LOOP AT gt_return ASSIGNING FIELD-SYMBOL(<ls_return>). I also tried to use inbound IDOC method, because I don’t have to care about adressing the item row numbers and everything is done by SAP standard. The problem is that the IDOC completely IGNORES the MSGFN field. Therefore you are not able to neither modify nor delete line items of a source list. The only action you can do this way is to INSERT new items. co_idoc_basic_type TYPE edi_idoctp VALUE 'SRCLST01'. ls_header-msgfn = '005'. "This is ignored!!! ls_item-vrtyp = 'L'. " L = scheduling agreement"
lt_control_recs TYPE TABLE OF edidc. In the called form READ_SEG_E1EORDM you won’t find a row, where ZEORD is read. Even if the ZEAORD was read, on line #127 it is cleared. This means the even if you try to address line items from EORD by their positions (ZEORD), it will be cleared (by standard!!!) and everything will be treated as new line items. Next bad thing is hidden later in FM IDOC_INPUT_SRCLST, where it’s hardcoded, that all lines will be treated as NEW entries. Therefore you can’t use the IDOC method for updating or deleting entries unless you want to modify SAP standard. entries from the source list. The following code takes two input parameters (validity of the new line in source list) on the selection screen, invalidates all existing lines in source list which validity time frame overlap with the new line’s validity and creates the new line with given validity dates. CHECK lt_eordu IS NOT INITIAL. SORT lt_eordu BY vdatu bdatu. LOOP AT lt_eordu ASSIGNING FIELD-SYMBOL(<ls_eordu>). <ls_eordu>-bdatu = p_vdatu - 1. READ TABLE lt_eordu ASSIGNING <ls_eordu> INDEX 1.
p_vdatu = sy-datum + 1. This entry was posted in ABAP, Development, IDOC, Materials Management and tagged E1EORDH, E1EORDM, IDOC, IDOC_INBOUND_WRITE_TO_DB, IDOC_START_INBOUND, ME01, ME31L, Source list, SRCLST by Spider. Bookmark the permalink. specified tables nor defined by a “DATA” statement. “DATA” statement}. Can i get the rest of the code in last ABAP Option. Currently its only till start of selection. Thank you. Your analysis and solution proved invaluable!